MOSCOW: Russians warships in the Mediterranean Sea have fired four cruise missiles at the Islamic State group’s positions in Syria, the Russian defense ministry said yesterday. The announcement came as Syrian government troops pushed ahead in their offensive against IS and militants in central and northern Syria. 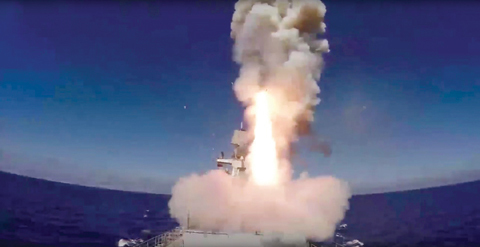 Moscow said in a statement that the Admiral Essen frigate and the Krasnodar submarine launched the missiles at IS targets in the area of the ancient town of Palmyra. There was no information on when the missiles were launched. Syrian troops have been on the offensive for weeks in northern, central and southern part of the country against IS and US-backed rebels under the cover of Russian airstrikes, gaining an area almost half the size of neighboring Lebanon. Most recently, Syrian troops and their allies have been marching toward the IS stronghold of Sukhna, about 60 km northeast of Palmyra. The strategic juncture in the Syrian desert aids government plans to go after IS in Deir el-Zour, one of the militants’ last major strongholds in Syria. The oil-rich province straddles the border with Iraq and is the extremist group’s last gateway to the outside world. Russia, a staunch Damascus ally, has been providing air cover to Syrian President Bashar Al-Assad’s offensive on IS and other insurgents since 2015. Moscow had fired cruise missiles from warships in the past, as well as from mainland Russia against Assad’s opponents. As the fighting against IS militants is underway near Palmyra, Syrian troops clashed with US-backed rebels in the country’s south yesterday, according to the Britain-based Syrian Observatory for Human Rights and Mozahem Al-Salloum, of the activist-run Hammurabi Justice News network that tracks developments in eastern Syria. The fighting came days after the United States told Syrian government forces and their allies to move away from an area near the Jordanian border where the coalition is training allied rebels. The warning comes less than two weeks after the Americans bombed Iranian-backed troops there after they failed to heed similar warnings. Navy Capt Jeff Davis, a Pentagon spokesman, said on Tuesday that the US dropped leaflets over the weekend telling the forces to leave the established protected zone. Syrian troops backed by Russian airstrikes captured Palmyra in March last year and Moscow even flew in one of its best classical musicians to play a triumphant concert at Palmyra’s ancient theater. IS forces, however, recaptured Palmyra eight months later, before Syrian government troops drove them out again in March this year. Russia’s defense ministry said its statement yesterday that the strikes successfully hit IS heavy weapons and fighters whom the group who had deployed and moved to Palmyra from the IS stronghold of Raqqa, the de facto capital of the Sunni militant group and its self-proclaimed caliphate.